“Men may work from sun to sun, but women’s work is never done.” This memorable saying truly summarizes the life of women who play the role of efficient home-makers. Home-makers are naturally skilled to manage the functioning of entire house. They have to cook, clean, arrange the daily mess as well as take care of their kids, family members and occasionally guests too. Most importantly, they ensure that all desires and wishes of their family members are fulfilled. Many home-makers neglect their personal likes and dislikes as well as their physical and mental health under the pressure of responsibilities. However, unless the lady of the house is physically and mentally fit, the house cannot function smoothly. 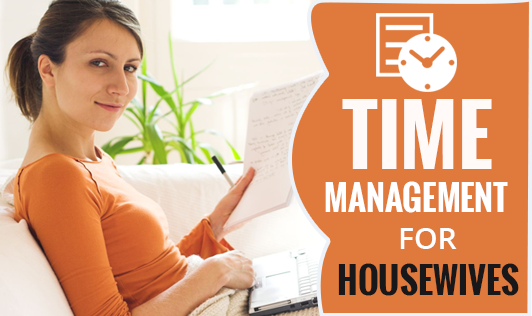 So, if everything that you can do or actually do, as a home-maker, is equivalent to a manager, why should you stay away from the benefits of time management? With effective time management, you can save a lot of time which you can utilize completely for yourself. Simple tricks like listing down daily jobs and prioritizing them, planning in advance for the next day and taking house help can make a lot of difference. A few daily jobs, such as cleaning can be done much faster when the family members are out. So, plan them accordingly. Also, dinner can be cooked a few hours in advance so that you can spend some time with your family when they are back at home. No matter how much time and energy you spend clearing the mess, with kids around, your home will certainly get cluttered at the end of the day. So be a bit flexible, and stop being a perfectionist.